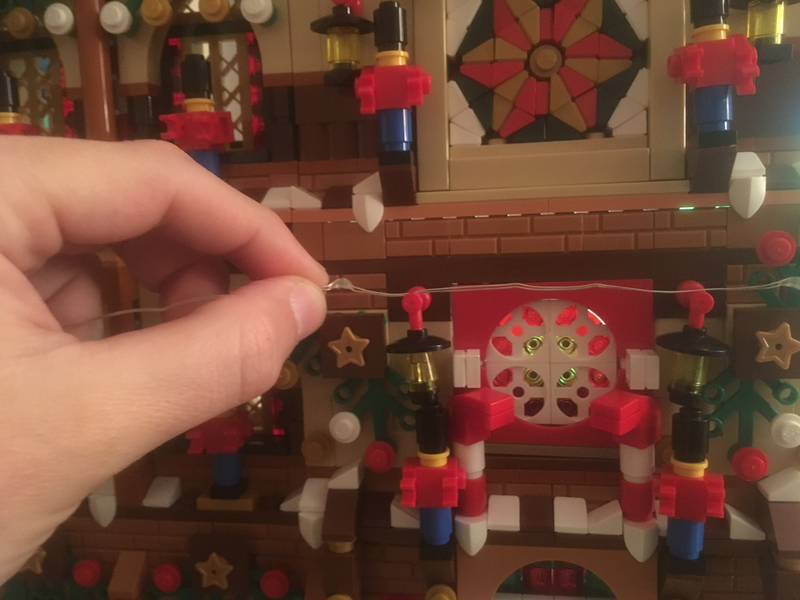 Does anyone have any ideas or recommendations for strings of small multi-color LED and USB lights that would look appropriate as Christmas lights on a winter display- like on block-built Christmas trees or the holiday village buildings? While I would prefer Lego compatibility, I would be ok with some good dollhouse or similar lights in about the right scale. I am also a BAFOL- a Broke Adult Fan of Lego, so cheaper options are generally preferred. I’ve just bought some for my winter village and despite how cheap they are, I’m very impressed. I got the ones on ‘silver wire’ which meant they could be bent to shape. The wire is so thin that it can be placed between bricks really easily. I’ll upload a photo in a bit. Excuse my fingers - I have not attached the lights yet. You can see how thin the metal is (similar to garden wire). These were very cheap from eBay. 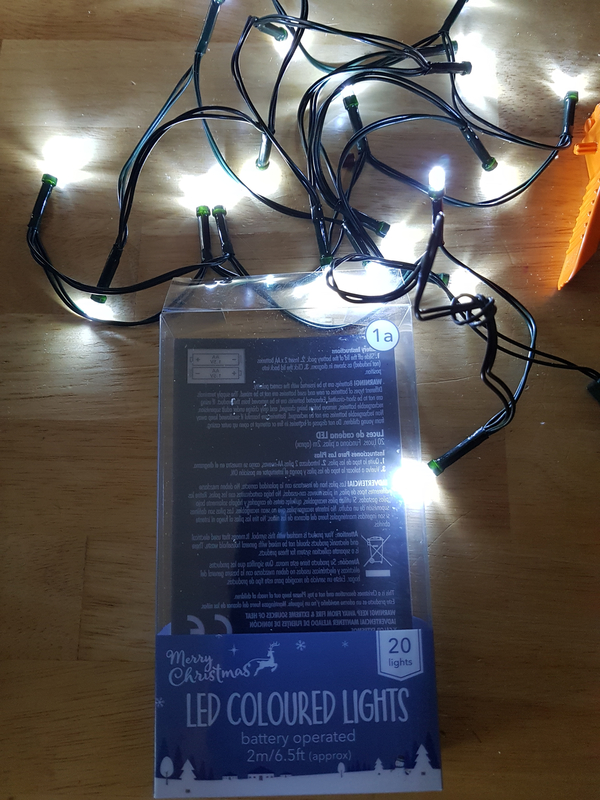 Less than £3 for 2metres of lights. 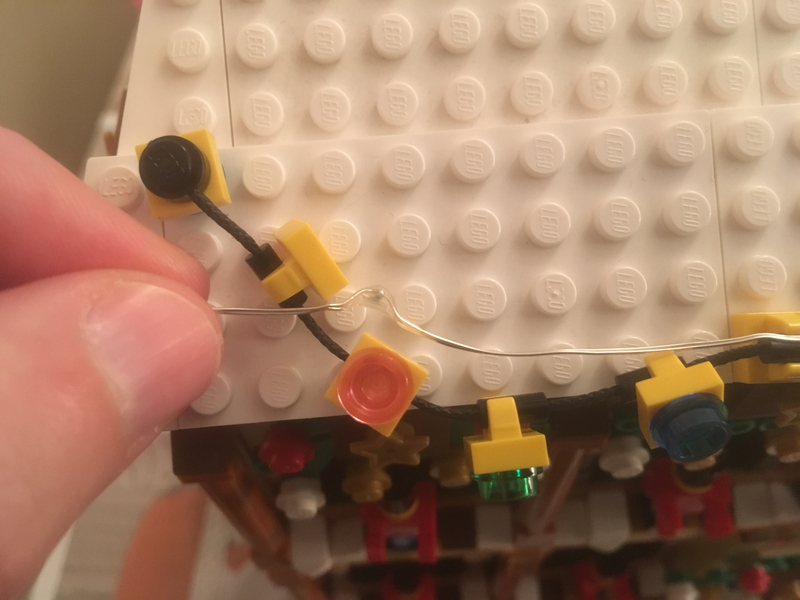 If you want lego compatibility, 3mm LEDs can just fit into a stud hole, and 5mm ones into holes in technic beams and bricks. You will have to do the wiring yourself, but this is pretty easy. I've been wanting to do the same for a while, but am quite the novice with DIY electric. Is there a step by step guide you know of...preferably in the context of LEGO or an AFOL? 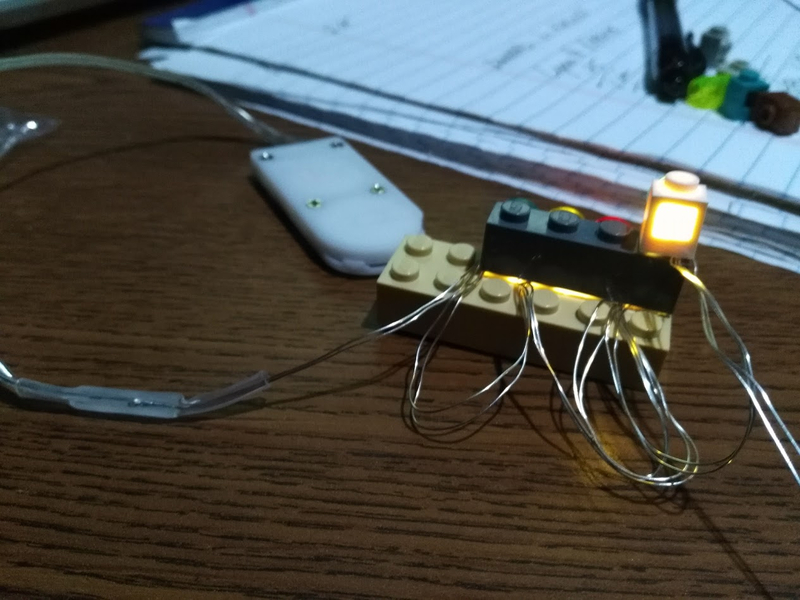 Here's a project for someone to 3D print, a set of working LED LEGO street lamps. Basically similar to the lamp strings you get for displays, but with a LEGO socket at the bottom and a stud with an LED in it on every post. You could attach any top to the lamps, since the light would be in the bottom part, and the wire would be like that above so you could hide it easily. You could even have them plug into a standard PF battery pack. Thanks for the ideas, people! FYI, Costco in the US (at least my local ones) currently have 4-packs of the light strands shown in the photo a few posts above. I believe it was $10? I plan on buying some to test this out. Thanks for the tip of the Poundland lights! Got 2 earlier for my winter village setup and they work a treat! Will need to go and buy a few more now! Seem to to be pretty decent for the price! You can't go wrong for a pound! Things went a bit wrong here! Still trying to find coloured ones but its the same in all the stores round here. Well, white is still a color, so they're not entirely wrong. Must be the brickset effect but my local store has sold out! Fingers crossed they get some more in as after some more!! Can these be dimmed? I've seen a lot of images where people lit the interior of their modulars and it looks like someone is arcwelding inside. Yes, just put a large value resistor (or variable resistor) in series to get the brightness you want. You could even go fancy and use some sort of PWM controller. I received these earlier today. Powered by a pair of CR2032 batteries, the battery pack is only 1" x 2" x 1/4" - much smaller than the 2xAAA battery packs on ones I found locally. No dimmer, but you can cut the string and the remaining lights still work. https://shop.lego.com/en-CA/LEGO-Power-Functions-Light-8870 Has anyone tried the actual LEGO branded solution? They’re not cheap when you consider how many you might want. 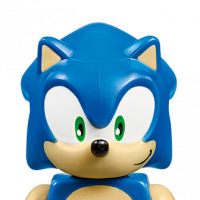 But I’m thinking they should fit in the back of a transparent headlight brick easily enough to be able to light up anything anywhere. They also have light up bricks. They seem to come in different colors, not sure if they have white though. Cool! I’d seen the light up bricks in the village sets before, but always the clear ones with yellow/orange lights. I had no idea they made a red version as well! I got a set for my Helicarrier, and while the lights are great and have a great LEGO compatible plastic molding, the wires are pretty heavy duty, and I could see it being a bad time if you started throwing a lot of them around. No photos yet, but some mini led Christmas lights from Walgreens are working for now. Wires are thin enough to run under bricks, sorta, and the battery pack includes a timer (6 hours on). The bulb spacing is not great so I had to do deal with that. You can get green or silver wires with white or multi bulbs, so that was cool. Thanks for the review Fizyx! I thought a set of them might work for my winter village where the wires could all stick out the back of hte buildings :& be covered over by white tape or something to blend in. 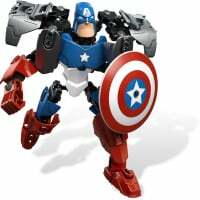 Where I’m not sure these would work is as a light source for single sets (beyond the cost) for anything smaller than the helicarrier since you’d also have to fit in the battery pack & whatnot. They run the standard PF voltage of 9V right? Why not just hotwire a 9V battery to them. It won't last as long but should last a while since it's just LEDs. Hmm good thought, that should work, & a 9V battery is easy enough to hide in a few more places. I second that, they do NOT need one of the huge battery packs to run them. 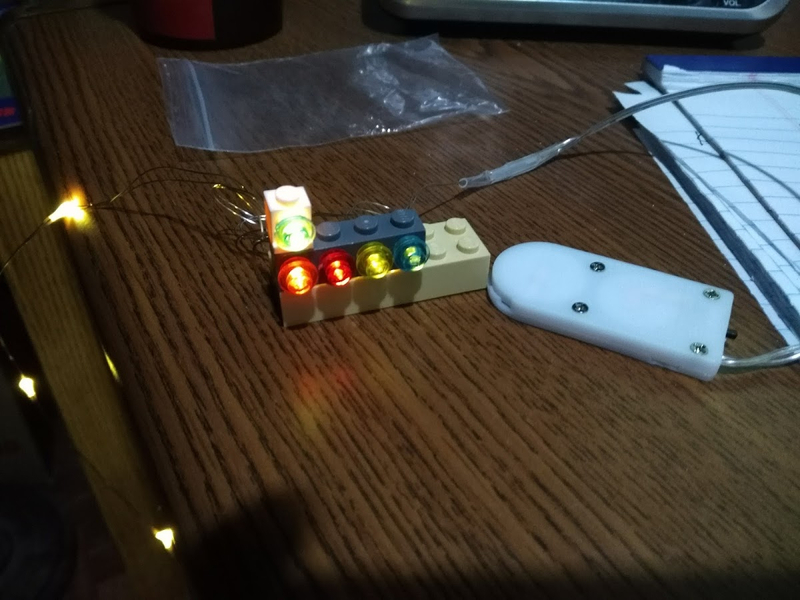 LEDs are power sippers, so jury-rigging it up to just a single battery (or smaller battery pack) and forgoing the whole official LEGO battery box is definitely the way to go.